Just finished watching, SPOIL, by the Pacific Wild and the International League of Conservation Photographers. It’s an amazing adventure through the Great Bear Rainforest (the world’s largest intact temperate rainforest and TWICE the size of Yellowstone park) in Hartley Bay, British Columbia, to support the coastal Gitga’at First Nations’ fight against a proposed oil export pipeline from the tar sands by Enbridge Energy. There are a number of important species in the rainforest including grizzly bears, marbled murrelets, mountain goats, northern goshawks and tailed frogs. The mission of the ILCP is to further environmental and cultural conservation through ethical photography. And they’ve rounded-up some of the best photographers in the world to bring attention to the environmental issues. The group has a number of interesting ways to mobilize including; RAVES (Rapid Assessment Visual Expeditions) and Tripods in the Mud/Sky (which lends photographers to conservation initiatives). 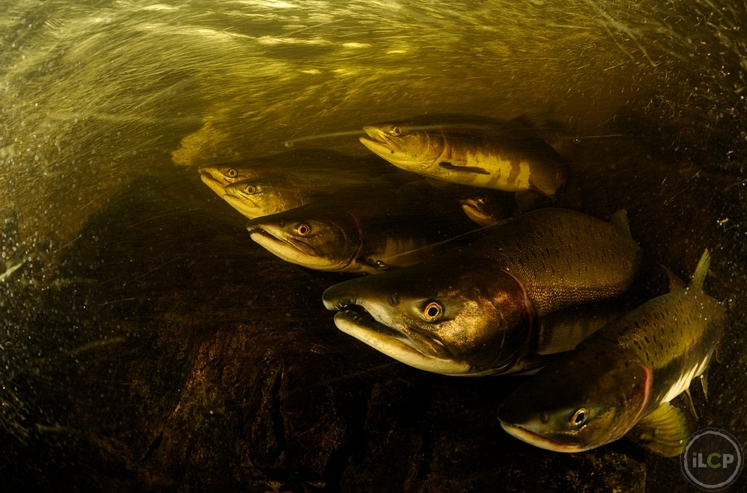 In SPOIL, the photography of Thomas Peschak stands out for his expedition below the rivers of BC. 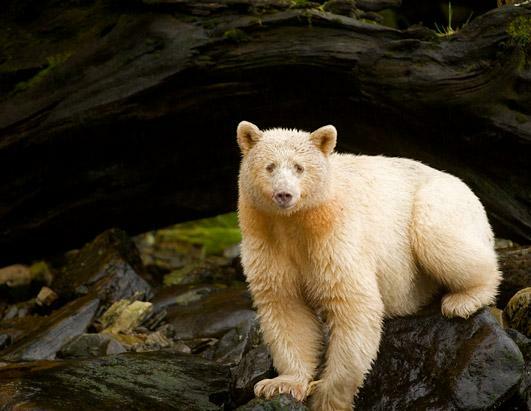 In this memorable documentary, the iCPL photographers go on a RAVE and document the First People’s life on the land, the rainforest and its denizens, including the infamous “spirit bear”, a black bear with recessive genes that make it albino or white–though golden might be more apt. Two beautiful scenes include the First Nation members of the Gitga’at fishing for salmon and trout, and a “spirit bear” guide assisting a National Geographic photographer to document the bear of legend. I’ve always wanted to go to Alaska, but I’m now considering taking a trip to BC instead in support AND to fish for “humpies” (pink salmon) in Hartley Bay. The eco-friendly King Pacific Lodge and Gitga’at are in a mutual partnership–the Gitga’at are in fact, “hosts” of the lodge in the preserve. Coho and Chinook salmon are also apparently abundant, though the lodge recommends only one halibut per guest (they say they are at LEAST 40 lbs. anyway). Thanks Wildwood for the find. I’ve got Tribeca on my mind, or more precisely, the 2011 Tribeca Film Festival. Tickets are on sale and my office on Varick looks directly out on the Tribeca theater and I have a couple of key clients engaged at the festival this year. MoFilm, which produces a film competition, “helping aspiring filmmakers create videos for big brands and social causes.” They have engaged some amazing filmmakers over the years, including my old boss Spike Lee, and count producer Jon Landau as a partner. The winner of the film contest gets a screening, trip, and cash prize at the festival. A dear friend of mine, London-based producer Mia Bays, has had successful films at the festival before (Bafta-nominated SCOTT WALKER – 30 CENTURY MAN by Stephen Kijak), and is returning to support, FIRE IN BABYLON by Stevan Riley. Babylon is about the West Indies cricket team in the 70’s and 80’s that went undefeated for 15 years straight against the dominant Brits and Aussies. This was the first all black team in sporting history to triumph in this way. According to Bays, Sir Viv Richards and Michale Holding are the documentary’s heroes and they tell the film in their own words, along with great archival footage and music, featuring Bob Marley, Gregory Isaacs, the Toots and the Mayals. Its produced by two oscar-winnign producers, John Battsek (ONE DAY IN SEPTEMBER) and Charles Steel (THE LAST KING OF SCOTLAND). Not being a huge follower of cricket (ok i don’t even know HOW to watch the game), I’m sure it’ll be an education, and incredible story of sports history. This year, Will Leather Goods designed and manufactured the official festival bag and I’ve got to find a way to score one… This film ought to go into the Film CRAFT section of deadbait, but it fits nicely here too. Shot on location in Eugene, OR and El Paso, TX, it details the making of the bag in detail set to music by Dawes. After several years in Williamsburg, I’m moving to Ft. Greene in Brooklyn next month to a lovely brownstone building on historic Clinton Ave. I’ll write about the history of this lovely neighborhood soon. Last weekend, in exploring our new hood, the wife and I visited the Brooklyn flea in Ft. Greene and managed to put down a Chai sticky bun and a lobster roll. 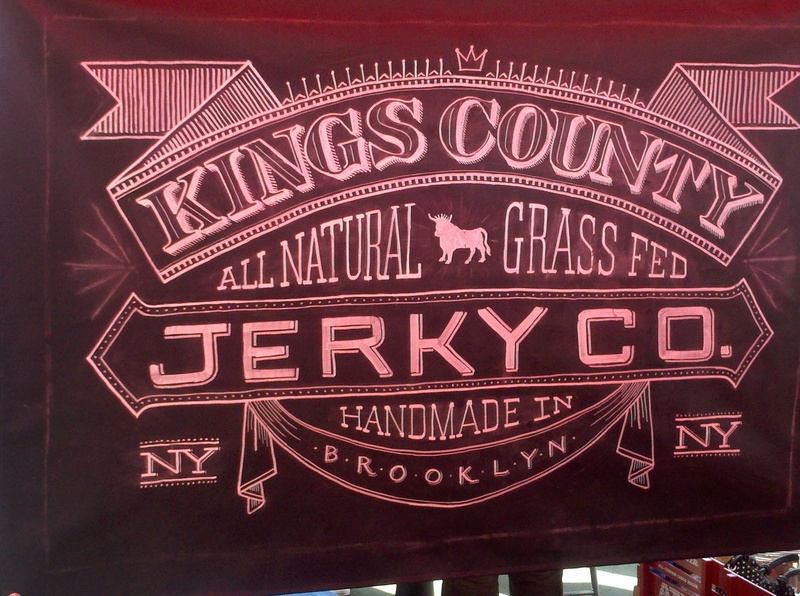 The best food find though was Kings County Jerky company. 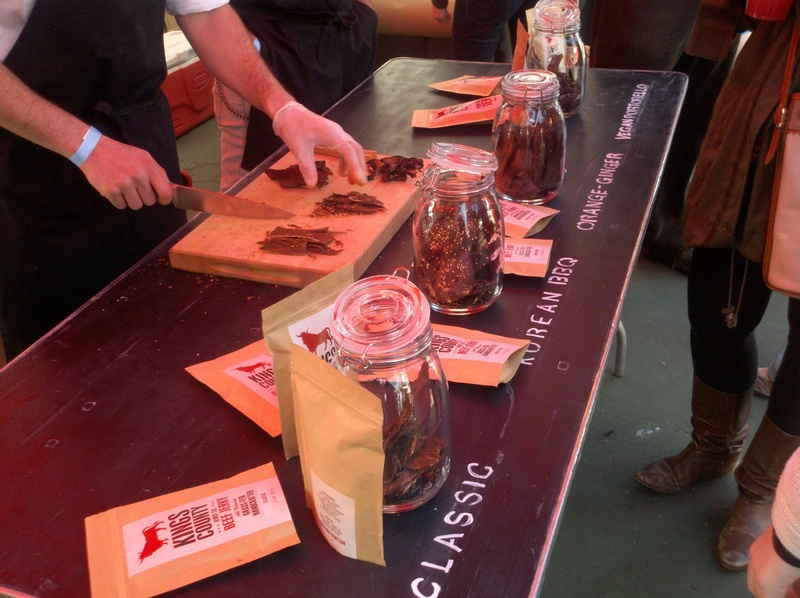 We tried all the flavors, including an amazing portabello mushroom jerky, but wound up buying the Korean BBQ jerky. 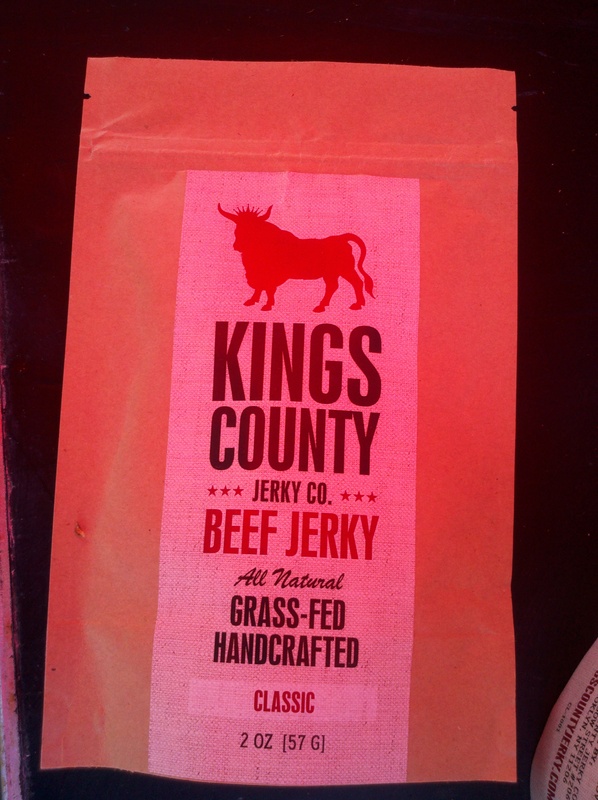 There meat is grass fed, all natural ingredients, no preservatives or corn syrup. My fishing buddy and I killed the entire pack last Sunday fishing Kensico. 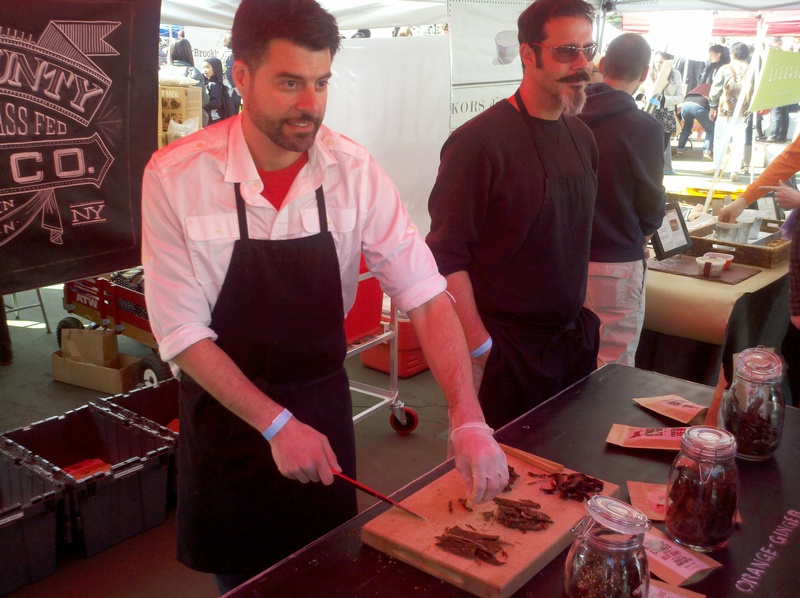 According to the press, Chris Woehrle and Robert Stout, really pushed their concept for artisanal jerky from a home kitchen endeavor to a business when they entered Rooster Design’s Next Big Small Brand contest. My fav kombucha, Brooklyn Kombucha, was also a contestant. Though Woehrle and Stout didn’t win, the contest drove word of mouth and cemented their business. They moved to a professional kitchen and got to work (but they kept their day jobs). 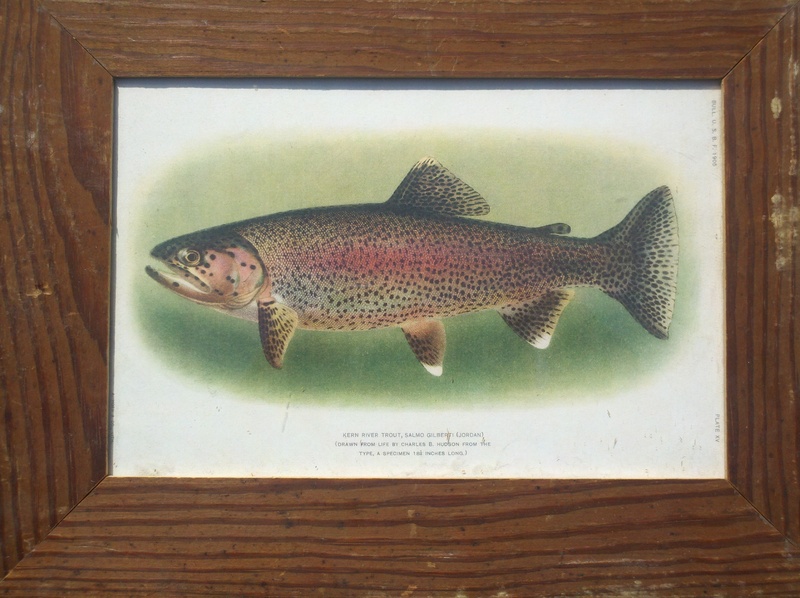 Another surprising find amidst the vintage bric-a-brac and knick-knacks, were framed posters of some of my favorite fish, brown and rainbow trout, largemouth bass and fluke. And now for the piece de resistance! 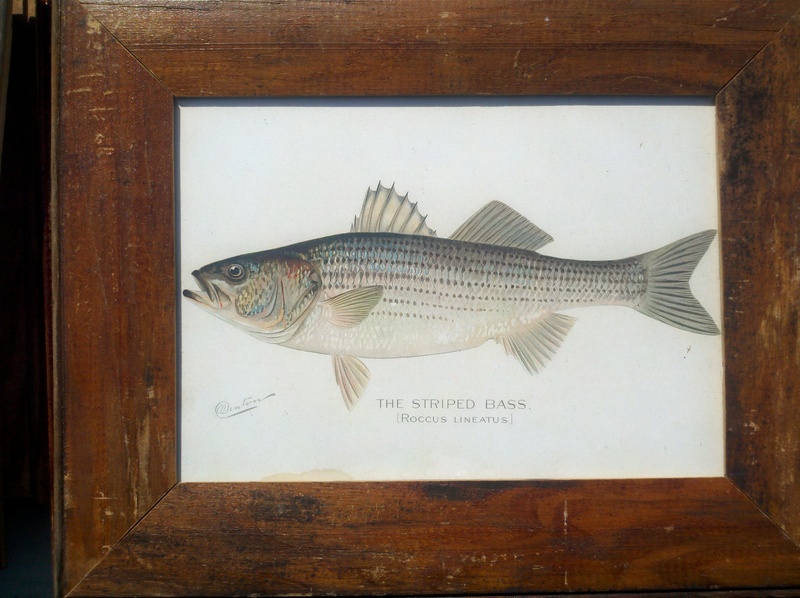 The Striper…coincidentally, the season on Stripers opened on April 15th. 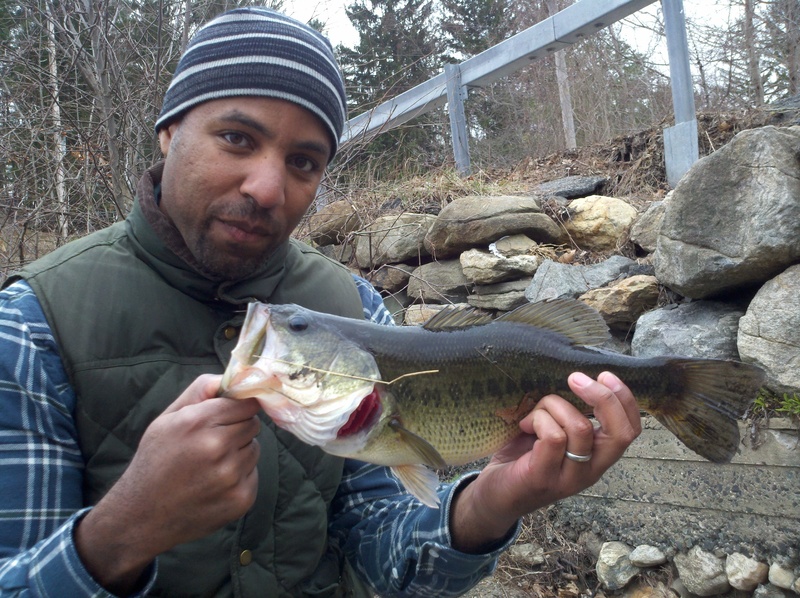 I have spent the last couple of years getting to know Kensico reservoir for my local fishing, and now that the weather’s turned and the ice is out, I was eager to get back out and fish for Lake and Brown trout. 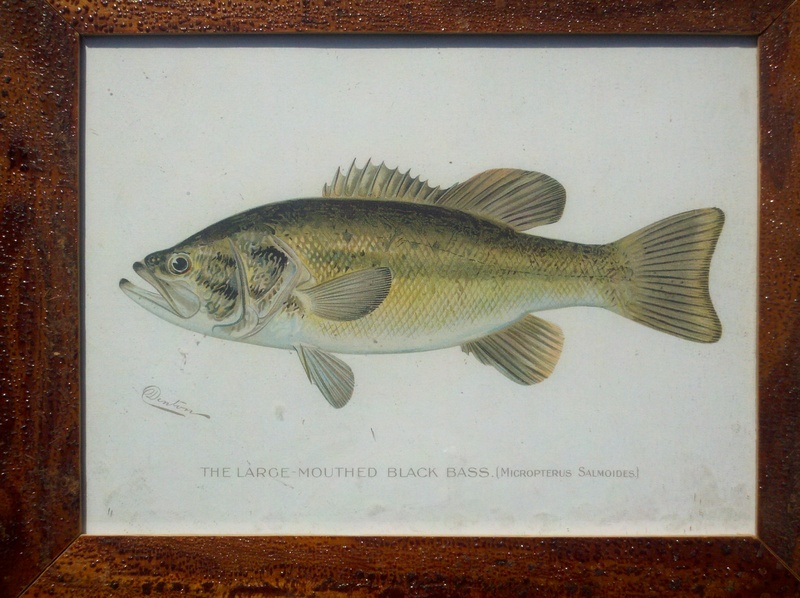 Now my buddy and I have gone out several times together and we’ve always been skunked–Kensico is a tough lake–but only when we fish together. Other times by myself, I always do alright. Determined to break the trend, we hit the lake again yesterday. Gorgeous weather, new gear, renewed hope, plenty of guys on the forums saying they were catching ’em and catching them big time, 8 lb lakers! But wouldn’t you know it, we get there and the lake is like glass–absolutely ZERO current. Any fisherman will tell you, no current, and the fish shut down. The guys trolling had better luck because they were able to get out into current in the middle of the lake or under the bridge. After a morning hopping around to different spots looking for current, we decided to break from the norm and just fish another reservoir altogether. We drove 20 min. north to Cross River and the lovely little town of Bedford. After a brief stop at the local bait shop for some intel and shiners, we headed back out. Cross River is actually TWO lakes, a large body and small. The baitshop owner told us not to “overlook” the small lake, and I could see the small lake was getting plenty of current from an easterly wind. We hit it and immediately hooked-up with Perch. 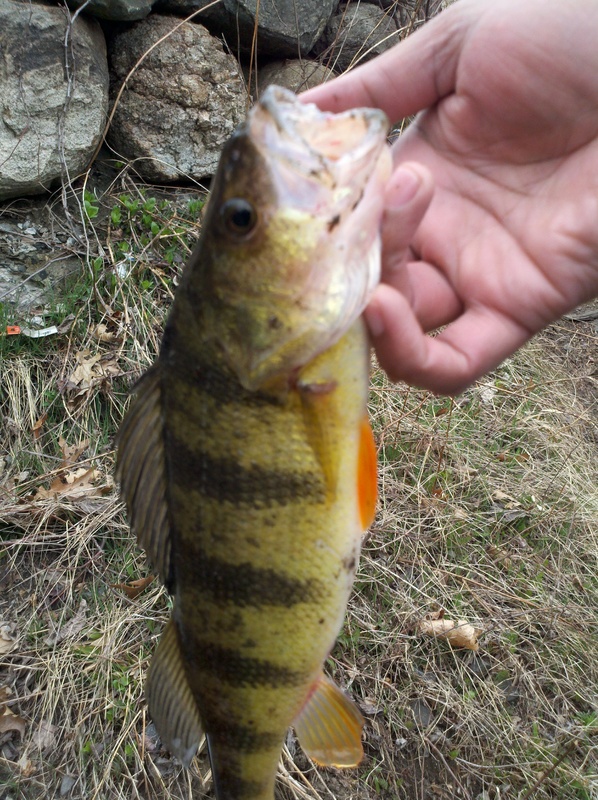 Stupidly, I threw it back saying “my dad would have killed me for throwing back a perfectly good perch.” After a few minutes we decided to go for the big lake and as I was pulling it in–hookedup with another perch. We stayed and hooked up with two more, and at that point, I kept ’em. We had a mess of eating-size yellow perch. Fired-up a school of them. Now, I grew-up eating perch in Ohio and I am a fiend when it comes to these babies. 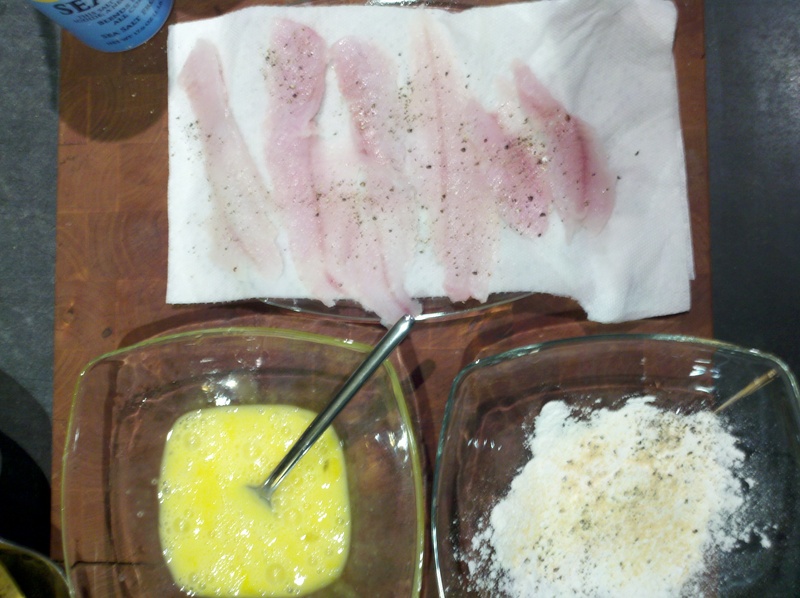 They are work to filet (if you have a dull knife), but they are in my opinion the best panfish on earth. 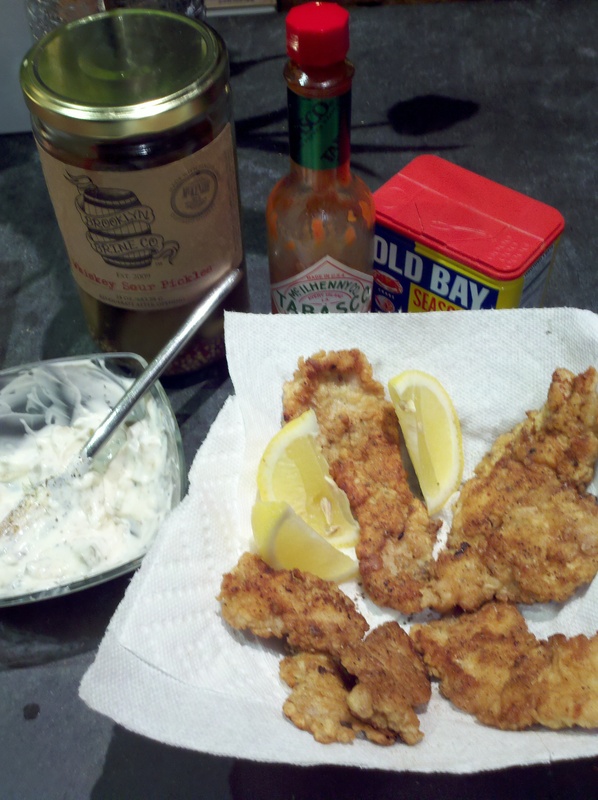 I fried-up the perch later that night with a touch of Old Bay and a homemade tartar sauce using Brooklyn Brine’s Whisky Sour Pickles, served with lemon wedges for the wifey. Alas, my buddy didn’t catch a single fish though he did have several nibbles. To add insult to injury, I hooked up in just about the same spot with a 4.5 lb largemouth bass! It caught it casting parallel to a reed bed that just looked “bassy.” The LMB put up a good fight and I don’t think it had spawned yet and it was possible I had pulled it off a bed. Well now that the season is really open, the plan is to get out early, often and to try more reservoirs this year. There are no less than ten within an hour and a half drive from Brooklyn. 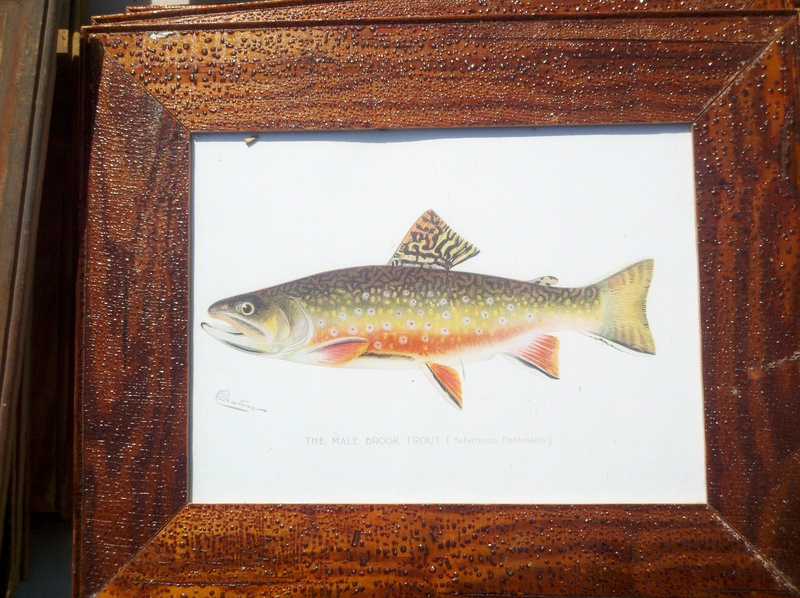 For the fishermen out there–Happy April, happy spring and tight lines! Its April and that means fishing season is open! Apparently the boys up at Kensico are pulling in 8 lb Lakers already and the reservoirs are all thawed out. Well, last week I was “stuck” in Miami for a conference and decided I would get in a day of fishing in Key Biscayne with Capt. Ken Collette. Ken was a gracious, smart, and funny guide. I first saw him on Mike Iaconelli’s fishing show “City Limits Fishing” and watched him put Mike on fish in Key Biscayne within sight of the skyscrapers and bridges of Miami. My buddy and I met up with Ken at dawn and made our way out to the overpass on the way to Key Biscayne to fish for tarpon. 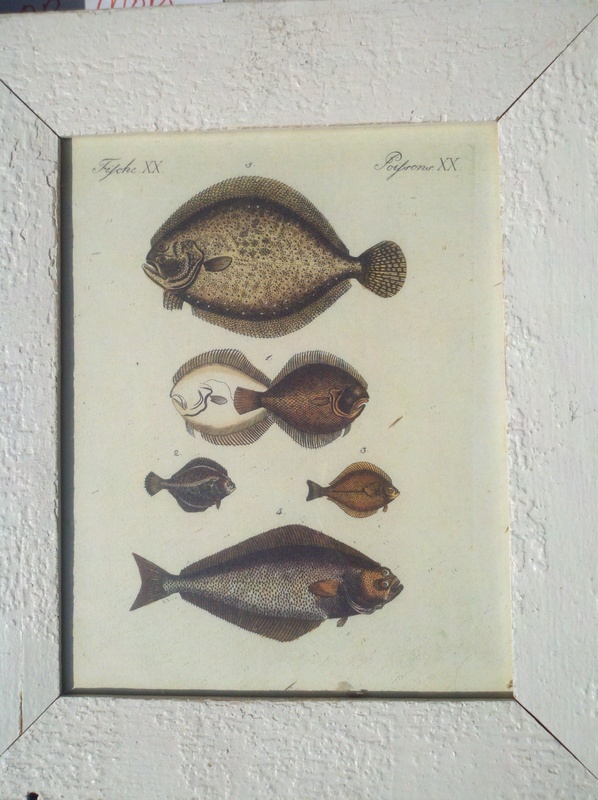 The tarpon were busting all over the place, but they wouldn’t take a crab, shrimp–even Pinfish were ignored. They were acting “tarpony!” The wildlife was everywhere, cormorant, pelican, eagle rays, porpoise…but no tarpon bite. Finally we decided to fish for bait for an afternoon of shark fishing. 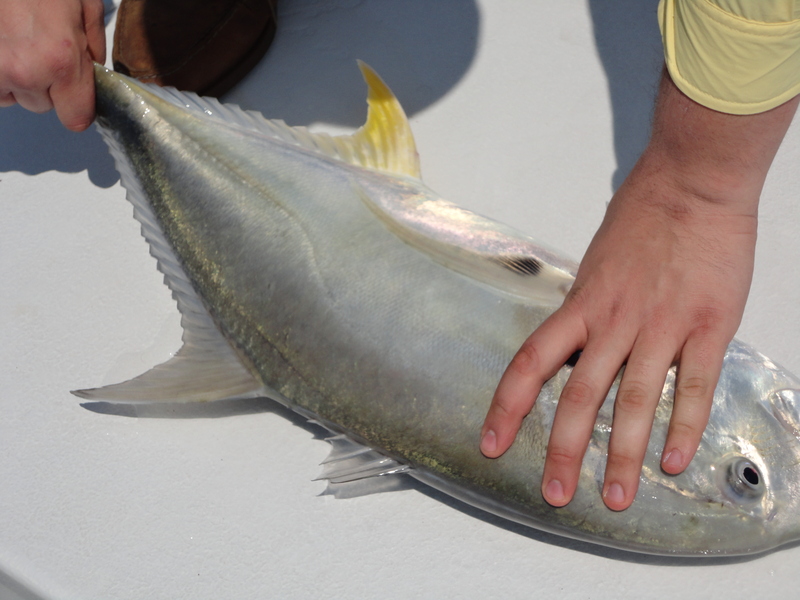 We pulled in a few bluefish, ladyfish, blue runners. My buddy fought a 20 lb Jack on very light tackle for about 15 min right next to the seaquarium. Finally, we headed out about 7 -8 miles past “Stiltsville” and to Ken’s shark honeyhole. Stiltsville was built in the 30s, and consists of fishing shacks about a mile south of Cape Florida. Looks like there are about 6 or 7 left, and only their pilings remain in some places. I spotted one with a slide, but I can’t imagine why anyone would want to slide into sharky waters. We cut up the bait and the Jack (my buddy swore the meat looked edible but was willing to sacrifice it for the shark). About 10 minutes of chumming produced whitetip, spinner shark, blacktip and a gorgeous hammerhead. I hooked-up with a black tip which proceeded to do a quarter mile run. It was like pulling up a car engine. A 30 min. fight from one flat to another and he finally rolled-up. My burning arms! His bright orange cat-eye startled me, as well as a row of teeth. He was fat and well-fed. After thanking the shark for the battle we set him free and headed back in on the hunt for a bull shark. No luck, the weather and wind had picked up and though we had a few followers, the bite was shut down. If you’re in Miami, I suggest you give Capt. Kenny a call if you want a great day on the water. Capt–we’ll be back for those tarpon soon! Click on the picture below to visit my Tumblr blog for more pictures from the trip. Now its time to clean-up the gear and head North to Westchester for some early season bass, Lakers and Brown Trout. Time to use some of my vacation days.